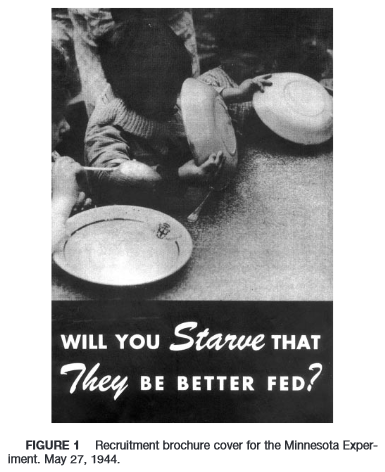 They starved so that others be better fed: remembering Ancel Keys and the Minnesota experiment. by Kalm LM, Semba RD. During World War II, 36 conscientious objectors participated in a study of human starvation conducted by Ancel Keys and his colleagues at the University of Minnesota. 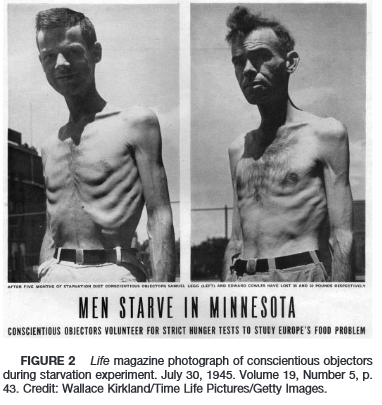 The Minnesota Starvation Experiment, as it was later known, was a grueling study meant to gain insight into the physical and psychologic effects of semistarvation and the problem of refeeding civilians who had been starved during the war. 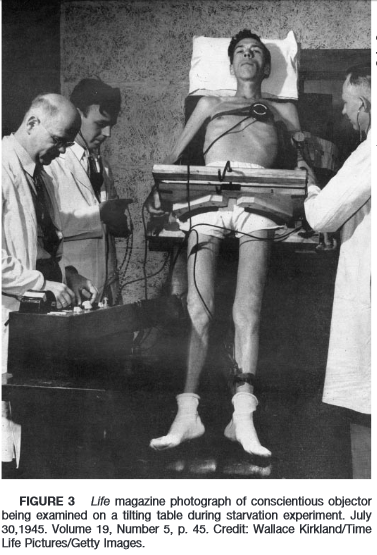 During the experiment, the participants were subjected to semistarvation in which most lost >25% of their weight, and many experienced anemia, fatigue, apathy, extreme weakness, irritability, neurological deficits, and lower extremity edema. In 2003-2004, 18 of the original 36 participants were still alive and were interviewed. Many came from the Historic Peace Churches (Mennonite, Brethren, and Quaker), and all expressed strong convictions about nonviolence and wanting to make a meaningful contribution during the war. Despite ethical issues about subjecting healthy humans to starvation, the men interviewed were unanimous in saying that they would do it all over again, even after knowing the suffering that they had experienced. After the experiment ended, many of the participants went on to rebuilding war-torn Europe, working in the ministries, diplomatic careers, and other activities related to nonviolence.